Zanzibar, even the name of the island stirs up images of an exotic and faraway land and to be truthful your imagination is not wrong! 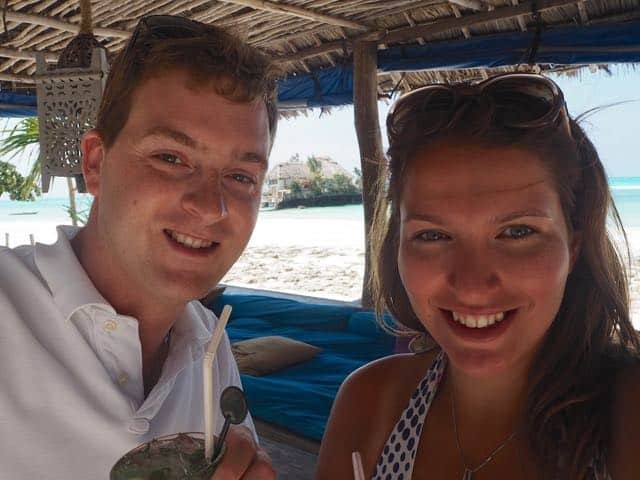 Zanzibar is truly one of the most beautiful destinations I have visited and somewhere that could suit all different sorts of travellers and tourists as it has the beautiful beach front resorts you would expect on an idyllic island but it’s also not somewhere most people go for a casual holiday jaunt and has an intrepid feel to it. Finding out what to do and see in Zanzibar was actually quite difficult as many visitors come straight from safari on the mainland and just want to chill out on the beach, however me being the person that I am wanted to have something planned for each day so I trawled Tripadvisor and Pinterest on the must do’s for the island. I think the other half and I did pretty well in our week there as we felt we saw and did plenty as well as had time to relax. The only thing I knew about Stone Town before visiting was that Freddie Mercury (of super band Queen) was born here so I was pretty sure I wanted a guide to ensure we got the most out of our visit. 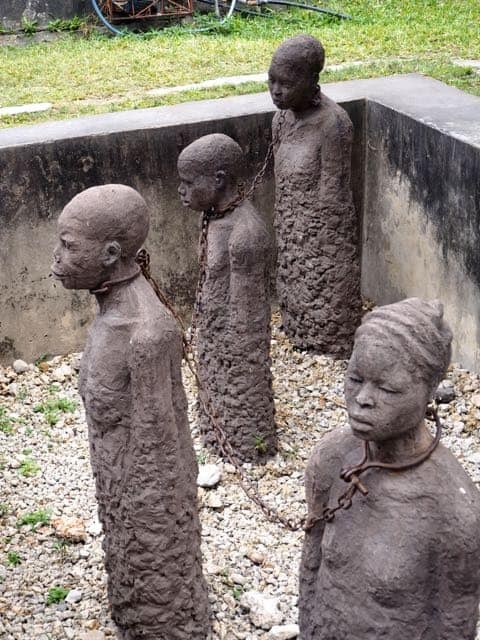 You really can’t come to Zanzibar and not see Stone Town, it’s historical and artistic importance dates back to the 19th century and it’s links to the Slave Trade are an interesting yet stark reminder of Zanzibar’s once flourishing past. We hired our guide through Madeira Tours (they also were our airport transfers) and the communication with Abdullah the Managing Director was great. I will do another post on everything about Stone Town as it really deserves a special mention, we didn’t expect to love it here as much as we did but found everything to be so interesting. 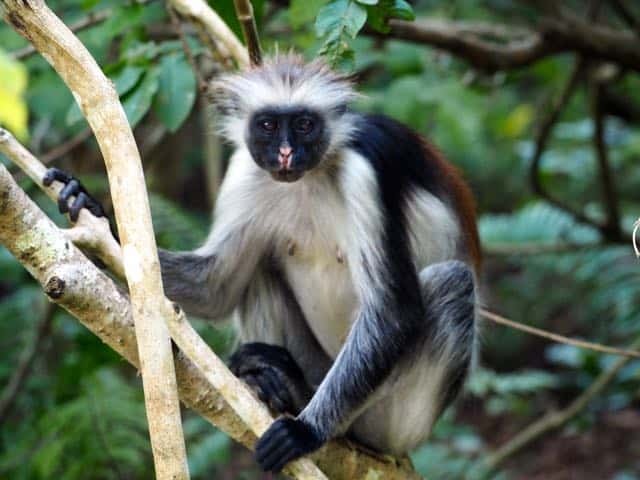 A trip into Zanzibar’s only national park will reward you with fantastic sights of its endemic red colobus monkey population. 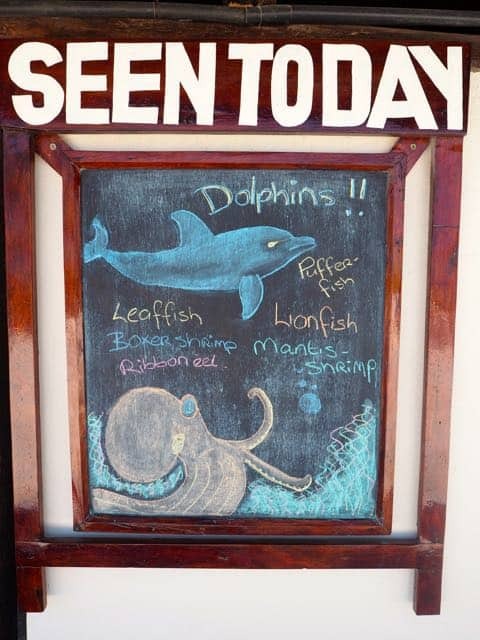 It’s the only place in the World to see these guys in the wild. Due to Zanzibar’s conservation efforts to keep the endangered population growing your entry to the park does come with a fee for hiring a guide, meaning if you are already on an organised tour you have to pay for another guide who will take you round the forest once arriving at the park entrance. This is of course perfect if you choose to come here without another organised tour. 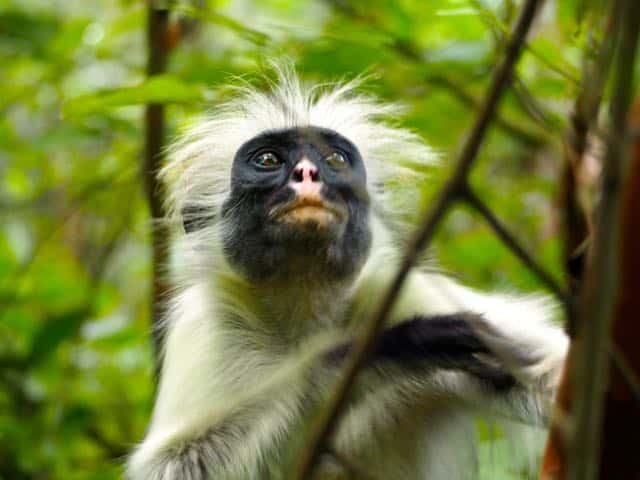 The guides take you through the forest in search of the monkeys and other wildlife such as the tree hyrax and bush babies. Spotting the mysterious Zanzibar Leopard would prove to be even tougher than seeing a leopard on our safari, the last recorded sighting was in 2003. The paths are all well placed and well marked out but the guides seem to like making you feel like are really in the jungle by getting you to tramp through the bush to get closer to the monkeys. 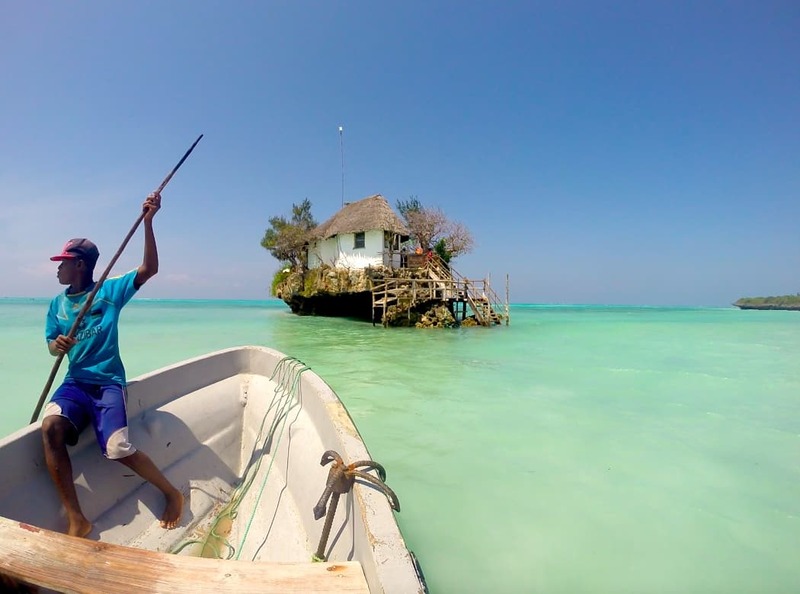 When stalking Pinterest in search of what to do in Zanzibar, the pictures that always seemed to attract me the most were those of The Rock Restaurant. Luckily for us the restaurant is owned by the same people as the resort we were staying at and was just a short 20 minute beach walk or taxi ride away. 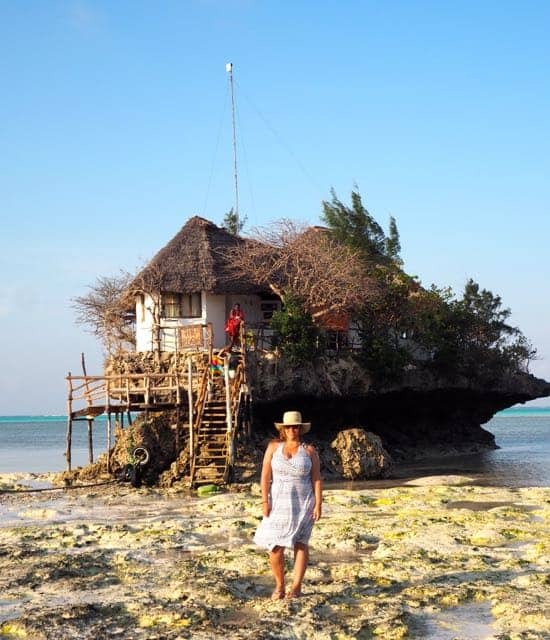 The Rock has been featured in many high fashion magazines and regularly appears on ‘you have to visit here’ lists and as we were already conveniently located on the Michamwi Pingwe peninsula it was a no brainer that we would be visiting! 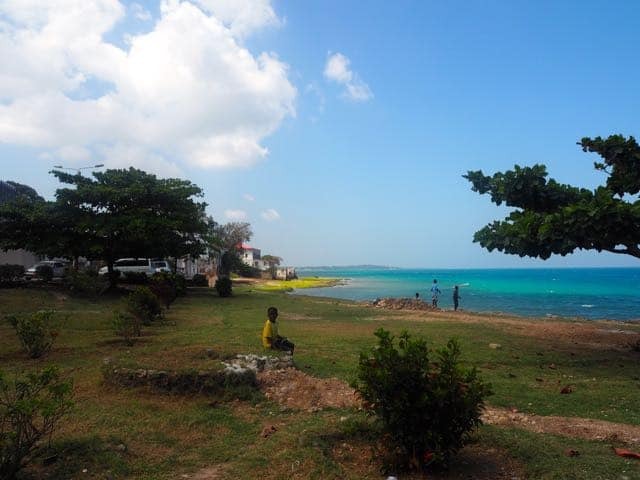 It’s still only an hour to visit from Stone Town and 10 minutes from the popular beach resorts at Paje. Getting to the Rock is an experience in itself, once on the beach dependent on the tide you will either need to get the small boat over to the restaurant or you could walk up but don’t guarantee on getting back the same way you came as the tidal changes in Zanzibar are notorious so you may have to do the opposite to get back to shore once you’ve finished on the Rock. It’s such a stunning location, we decided to forgo the full meal option and opted to have cocktails and appetisers on the sun deck area at the rear of the Rock. Service was attentive and the cocktails delicious. Many reviewers had complained at the high prices of food and drink but I didn’t think for such a unique experience it was too bad and everything we ordered was of high quality. Just make sure you make your reservation in advance via their website. 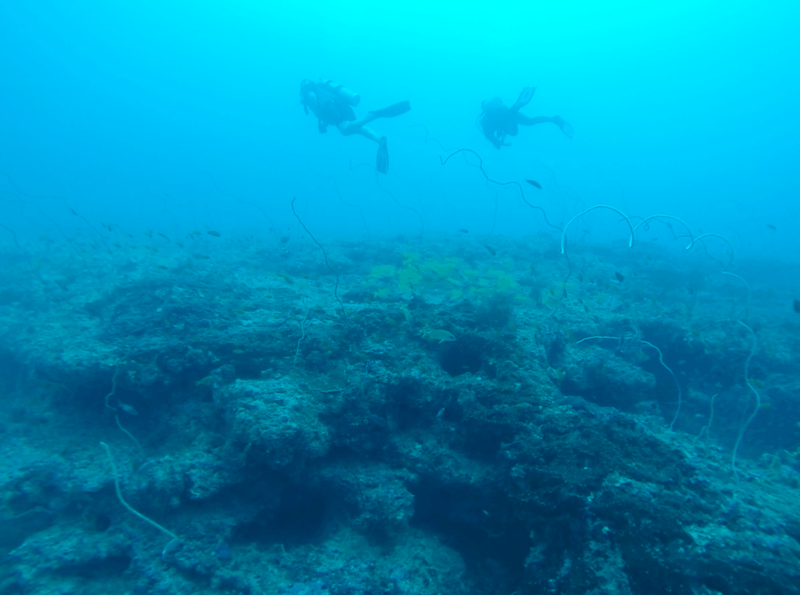 Obviously one of the main draws to the island for us was the underwater world, you can read about our scuba experience with Rising Sun Dive Centre in a later post but it’s a great place to dive for all levels of diver with some of the most amazing colourful corals I have ever seen. I would say though that decent sea sickness tablets are a must as the sea can get very choppy and you may end up feeding the fish without it! Not only were the sights underwater spectacular and crowd free but we also had the amazing experience of seeing dolphins and humpback whales off the dive boat! 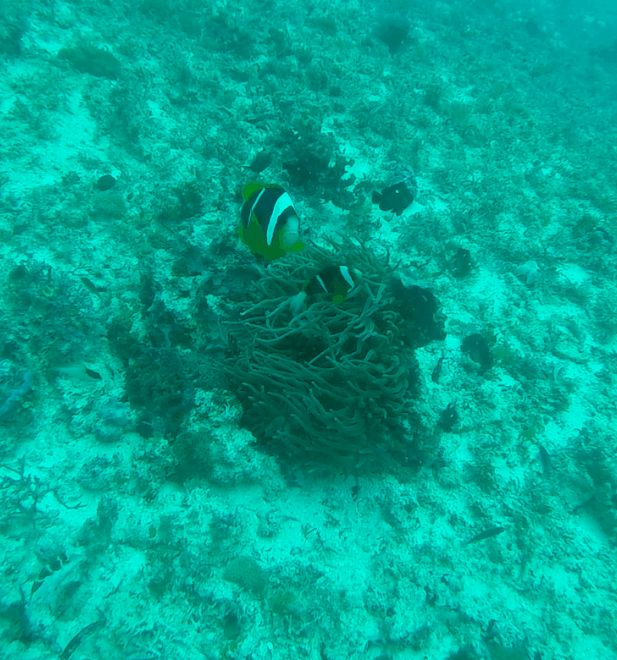 Sadly they didn’t stick around to join us in the blue. 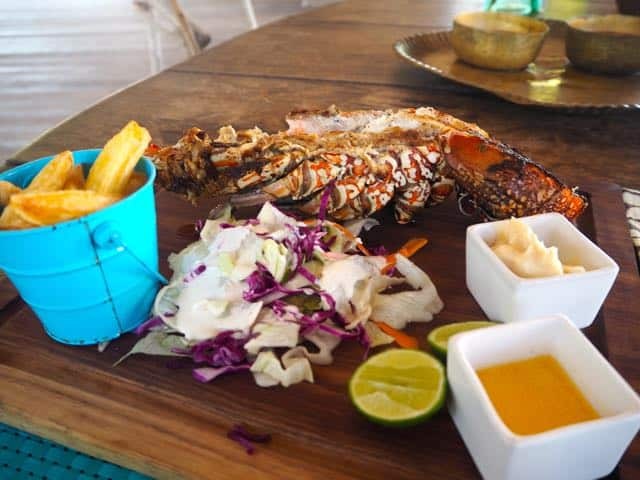 On the recommendation of the lovely people at Rising Sun Dive Centre we decided to eat and spend some time at Upendo Beach restaurant just opposite the Rock. This was a great touch as not only is the food spectacular (and cheaper than the Rock!) 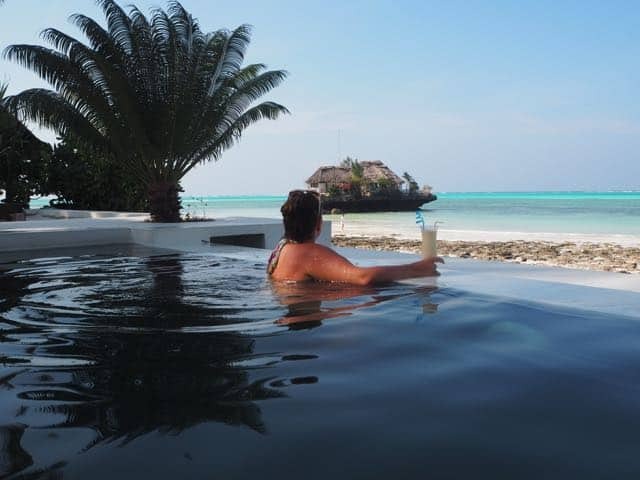 with amazing cocktails, you also get a perfect view of the Rock and you can use their pool for a dip in between courses and cocktails. 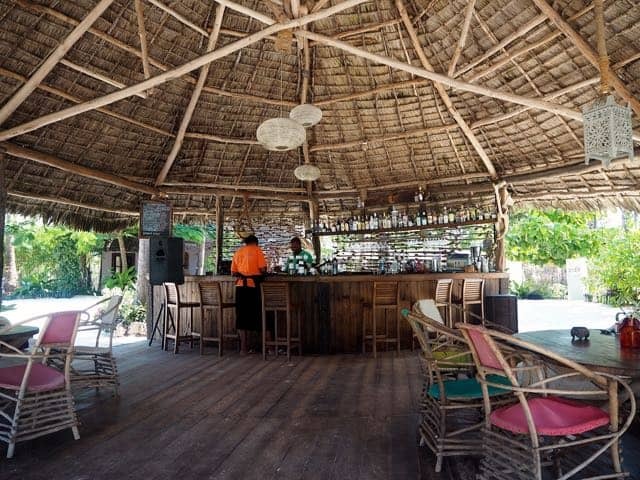 We loved the vibe of Upendo and if we were to return to Zanzibar we would probably check out staying in their beach villas and the legendary Sunday brunch each week. We stuck around for about 6 hours just enjoying the views, the pool and the great food and drinks. It felt like we were in paradise. 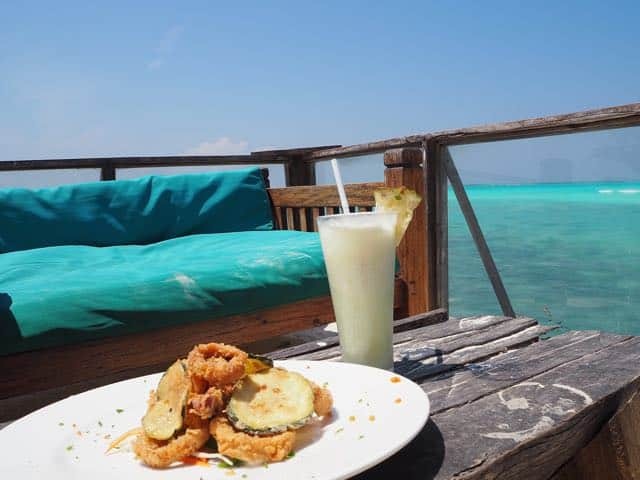 There is so much more to do on Zanzibar than what I’ve covered here such as taking a sunset or sunrise dhow cruise, a dolphin boat trip, a visit to Prison Island to see the giant tortoises or a look at the spice farms all of which could be booked through a tour guide or the accommodation where you are staying. 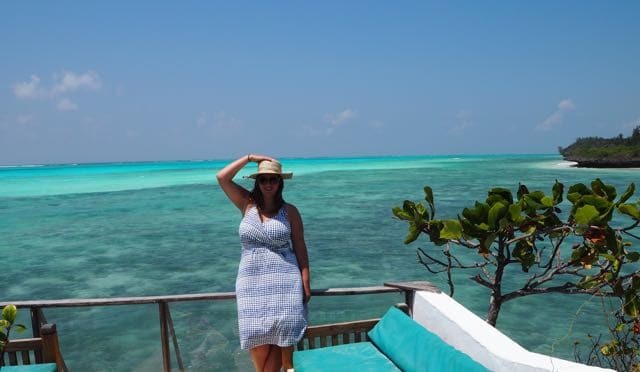 The standout things for me were of course the beautiful beaches and world underwater, what would inspire you to take a trip to Zanzibar?